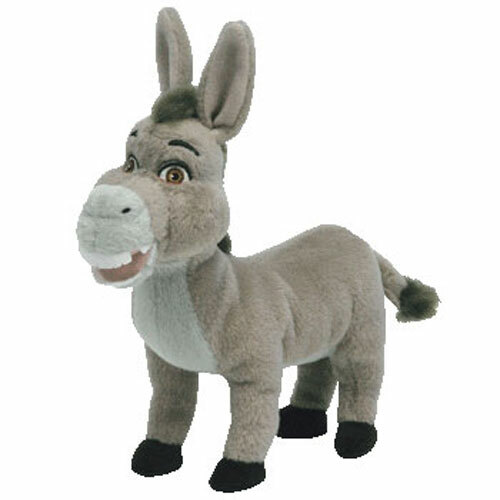 Donkey is made from a grey material with embroidered brown eyes, embroidered black eyebrows and a dark pink mouth with a row of white, felt teeth. His muzzle and belly are made from a pale grey material and he has black hooves. He has a fluffy grey mane and a fluffy tuft on the end of his tail. Donkey was released on 4th November 2008. He is based on the character from the Shrek movies. He was only available with any one of the following DVD gift sets; Shrek the Third, Shrek the Halls or Shrek Forever After.